Itching to travel, but fazed with your tight budget? We'll tell you where to go without spending much. Hey, we heard the likes of Singapore and Hong Kong are wonderful this time of the year. Taralets! The thing however is that lodging covers a huge chunk of our budget, which explains why most Pinoys are on a constant mission to find a place that's both cozy and affordable when they travel. It's not like you're going to be spending a lot of time in your hotel room anyway, but knowing that you have a sweet haven to return to after a long afternoon of sightseeing is always a travel plus! Despite being budget-friendly, the Cosmo Hotel Mongkok is in a class of its own. After you pummel through the busyness of Mongkok itself, once inside, you’re treated to some peace and quiet. A welcome respite after days of schlepping and shopping. For more options, browse AirBnB for affordable rooms you can rent near the Wan Chai area, one of Hong Kong's most central districts. You can also try websites such as RoomORama for accommodations in the lively Mongkok district. Traveler’s tip: Don't know where to grub cheap? Make a beeline for the traditional cha chaan tengs or tea restaurants. Want to booze up? Most locals and expats head to a nearby convenience store with friends, and spend the night drinking and mingling on the adjacent sidewalk—not kidding! While the cost of living in this city might scare any newbie, the secret to an affordable Singapore vacation is to look through unconventional areas popular with seasoned travellers. Search for Shophouse-The Social Hostel, a boutique hotel known for cozy yet cheap accommodations at the indie Arab Street area, or Five Stones Hotel at South Bridge Road for a quirky place to stay. Go to your preferred housing website and pick from a selection of accommodations within your budget, preferably located at bustling locations such as Chinatown. Traveler’s tip: Once you're there, enjoy the city's free (and beautiful!) parks, such as the perfectly manicured Gardens by the Bay, or the tree top bridge at MacRitche Reservoir Park. Bliss Surfer is a boutique hotel best known for its fantastic view of the Bali sunset, its bonfire lounge in the front yard, and the spa on the fifth floor. If you want things to be laidback and super chill, then you've come to the right place. Traveler’s tip: Go ahead and explore the east to see the majestic 'mother temple' of Besakih, or make your way to the heartland and post those beautiful rice fields on Instagram. From scenic vistas to cultural performances, there's always something for everyone in this romantic city. Conveniently located near tourist spots, popular attractions, and restos with authentic Korean cuisine, you'll always have an itinerary like no other while at The BOOT. Consider it you're home away from home with its cozy ambience, furnishings, and laidback cool (plus, a guide/host named Peter who will assist you for your travel needs). 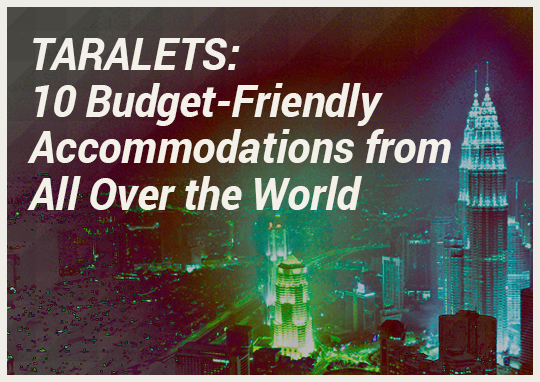 With a budget-friendly accommodation, now you have more funds to explore! Where to go next? Shop your heart out at Myeondong for original Korean cosmetics, pay for a tour and go back in time in Gyeongbokgung Palace, or visit the infamous Gangnam district for a more luxe environment. And when you return, this accommodation will fill you up as it offers unlimited noodles and biscuits, too! Traveler's tip: While most people find the visa requirement a hassle, it would greatly reward them to know that exploring South Korea doesn't cost much at all. To navigate your way through Seoul, start by purchasing a reloadable train ticket—Seoul has the most complicated train system in the world, so having one ready will save you a lot of time and money. Approximately 10 minutes away from Kuala Lumpur, V Garden is a trendy three-star hotel that is surrounded by a shopping center, a neighborhood mall, and an LRT station. But if you're more of an indoor person, you can explore the hotel's courtyard cafe and rooftop garden. Traveler’s tip: Kuala Lumpur may seem like a small city but tourists often need help navigating their way through this multicultural haven. From the Petronas Towers to the Menara KL Tower, it's home to some of the world's most iconic landmarks. All you have to do is look up! It's an unorthodox choice for a budget vacation, but Abu Dhabi is worth seeing nonetheless. You'd be surprised at what you can score in this golden country at almost no charge. One to One Hotel at Al Salam Street by the city center will make you feel like royalty, without the price tag. The best of its benefits: plush interiors and a central location. Traveler’s tip: If you're with a lover, stroll along the eight-kilometer Abu Dhabi corniche, a waterfront stretch where you can enjoy a magnificent ocean view. Every Tuesday, the city's very own Formula 1 track is open to the public for running or bicycling. The communal space the hotel offers is a hand-in-glove fit for backpackers who aren't planning on staying very long. The place features a large TV with cable and the dormitory-style rooms can accommodate all kinds of guests. It even holds parties for residents sometimes! Traveler’s tip: When in Tokyo, it would be a sin to miss out on the fish markets, the sumo shows, and the beautiful gardens. Start your trip by booking accommodations online—there should be a place by Downtown Toronto that won't burn a hole through your wallet. If you're the type to hang out with the backpacking crowd, Backpapers on Dundas is an affordable housing option that's a stone's throw away from most must-see places. Traveler’s tip: Canada's largest city opens their museums for free or for a reduced price after 6 p.m. on Wednesdays, so you can be a culture vulture at the Art Gallery of Ontario or the Museum of Contemporary Canadian Art, among others. Review performance schedules at the Yonge-Dundas Square as well, to catch plays, musicals, or concerts. We'll wager you'll have a fun time getting lost in the streets of Istanbul. It's a colorful and unique hybrid of European and Asian culture, as seen in its vibrant architecture and street scene. If you're worried about accommodations, don't be. There's a rustic brick-walled duplex for two that costs less than P1,800, or you can opt to check in at Hanedan Hotel at Akbiyik Caddesi where most tourists flock. Traveler’s tip: Keep an eye out for these: traditional street markets and bazaars that sell everything from tapestries to spices, ruined Byzantine churches that you can enter for free, and the hundreds of minarets and fountains that are worth an Instagram snap. If you're sociable, City Backpackers Hostel will give you the most value for your money. Located at Upllandsgatan 2a, it's near the Stockholm Central station and it houses an infamously boisterous crowd that never scrimps on the positive energy. Traveler’s tip: Revel in the center of Scandinavian design in uber-hip Stockholm. Get giddy with modern and architectural art at the Moderna Museet and Arkitekturmuseet, or spend a few hours at trendy Sodermalm, where you can enjoy a cheap cuppa joe while people-watching at a sidewalk café. If you're looking for an affordable data roaming package that'll help you search for budget-friendly hotels/hostels as soon as you step foot in your dream destination, we've got just the thing for you. With Globe Prepaid Roam Surf, you can enjoy 24 hours (P599), 72 hours (P1797), and 120 hours (P2,995) of mobile data to access the Internet in 50 countries worldwide. These countries include favorite travel destinations in the world such as Hong Kong, Singapore, and South Korea to name a few. That's a whole lot of surfing, chatting, and posting of Facebook updates, tweeting, and uploading of Instagram photos from abroad! Just dial *143# to select your Roam Surf subscription before you leave the country. Your subscription will start once you land in the country of destination and upon activating the data roaming capability on your smartphone. Also, don't forget to turn off your roaming service upon return to the Philippines by dialing *143#. For more information on Globe Prepaid Roam Surf, click HERE.